In the first article of our mobile-video series, we talked about why video creative matters for a mobile-first audience. Now, let’s get into specific strategies for video ads. First things first: Short videos work best in the News Feed and in Stories. By 2021, over 75% of the world’s mobile data traffic will be video. Most people are watching video on the go, tapping and scrolling whenever they get bored. Thumbs are poised and ready to skip your ad. At most, you have three seconds, but probably less, to capture viewers’ attention. In the mobile-video era, people simply don’t have the patience to stick around for videos they didn’t seek out. To get your message across on social media, you have to make video ads that are short and specific. Here’s why. Unlike on TV, you can’t tell an entire story in mobile video. You have to narrow your focus to a single goal. And you have to make your case in a matter of seconds, before another post, brand, or notification takes someone’s attention away. There’s a significant gap between marketers’ desire to reach audiences and audiences’ desire to pay attention to advertising. This is what’s known as the attention gap, and it’s grown wider since the rise of the News Feed. Facebook and other social media companies are constantly figuring out better ways to deliver a refreshing stream of hyper-relevant content about users’ personal networks. If advertisers can’t compete with that organic content, they lose. Short videos that stick to a single message will help viewers instantly understand what your brand’s about, making them more likely to act on that knowledge later. Mobile videos have to be short and to the point. But how short depends on the platform. Creating platform-specific videos will increase your chances of bridging the attention gap. Let’s break it down. Snapchat makes it really easy for users to bypass ads. Tap once and the ad disappears. But that hasn’t stopped video marketers from investing in the platform, which has high engagement rates from millennial and Gen-Z users. A study of Snapchat ads by MediaRadar points to an average video length of 8 seconds. The same study said that 60% of Snapchat video ads lasted 8–10 seconds. Some advertisers created videos that were even shorter, around 3–5 seconds. 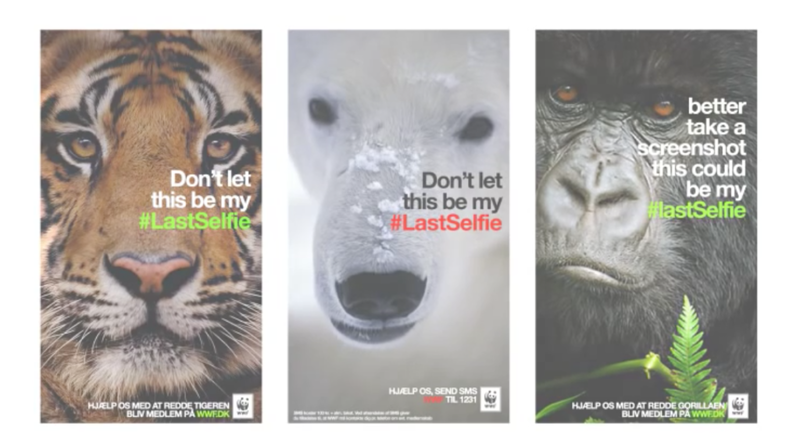 These World Wildlife Fund Snapchat ads include one image and one line of text, keeping it super simple and to the point. The result is a powerful campaign for protecting endangered species. Before Facebook became a feeding frenzy for advertisers across industries, users paid more attention to ads. At one point, videos lasting 30-60 seconds performed best. And sometimes, longer videos do work if an ad is exceptionally well targeted or well made. Of course, advertisers have different goals — maybe you want people to click a link, or maybe you want the viewer to keep watching till the end. Facebook video-length benchmarks vary. That being said, if you want to guarantee more people will see your message, you have to put it at the very beginning. A study by Facebook and Nielsen found that most of a video-ad campaign’s impact comes in the first 10 seconds of viewing. This doesn’t mean you have to cut your videos off at 10 seconds on the nose. But it does mean you’ll achieve maximum engagement with your video opener. And you might want to consider the diminishing returns of a video longer than 30 seconds. Consider these two versions of H&M video ads on Facebook. The left is adapted from a TV ad, and the right is optimized for Facebook. In the left video, a story unfolds about going on vacation. The right video cuts to the chase quicker: beachwear, on sale, now. The ad lasts for more than 10 seconds, but the main content is loaded at the front. You’ll also notice that the video on the right fills up the screen, making it more likely to catch the viewer’s eye when they come across it in the News Feed. Instagram is a highly engaging platform, but people still scroll past ads. To get people to stick around longer, Instagram puts a countdown clock in the top corner of video ads. They also tend to flash a bright call-to-action button in the first 3 seconds. Instagram feed ads can be up to a minute long, but successful ads don’t meet the maximum. Analysis by HubSpot found that Instagram ads that generated the most user engagement were, on average, 26 seconds long. Instagram is a great platform for building brand loyalty. But if your brand is relatively unknown, consider the stats posted by Facebook, above. If you want your viewers to remember your name and message, you’ll probably want to get that information out as soon as possible. Instagram Stories are extremely engaging, and users are increasingly spending their time in the top portion of the app. If you can make native Stories content that doesn’t turn people off, chances are lots of people will see it. In the case of Instagram Stories ads, the platform doesn’t give you much choice: The maximum time limit is 15 seconds. But you can create a carousel of videos up to a minute long, a.k.a. four videos. As with Snapchat, it’s incredibly easy to tap past Stories ads, so the imagery and copy need to spark instant interest. Videos featuring people — as opposed to still slides — can instantly make you stand out. NinjApparel used Shakr templates to create highly engaging carousel Stories ads for their clothing line. The first videos feature a real model and then cut quickly to slides of outfits. The ads were composed of three 15-second videos. Each 15-second increment included a call to action and featured their distinct branding. Perhaps most importantly, the ads were created for Stories in particular. They worked for NinjApparel’s audience because they blended in with organic Stories content. No matter how long your videos are, if you’re not using vertical aspects and including native features like swipe and tap, you’ll miss out on valuable audience attention. So far we’ve made a case for super-short video ads on mobile. But long-form videos are also carving out a space in the mobile landscape, and advertising could follow. Long-form video is a compelling trend, with YouTube, Facebook Live, and IGTV making it possible for viewers to find informative and entertaining content that lasts 20 minutes or more. According to data from Ooyala, mobile viewers spent 77% of their time watching long-form video. And according to the same study, midlength video is actually the least popular type of video for mobile viewers. While people will continue to watch videos on the go, more and more people will sit down and watch mobile video for extended periods. And as platforms adapt, that time spent will only increase. So while it pays in the short term to commit to short videos, consider how long-form video can also benefit your business. Perhaps you have a healthy pipeline of leads, and you want to engage people more deeply. Getting out ahead of the trend will give you a distinct advantage and make you stand out even more in a crowded field. Hopefully, you’re convinced that the first few seconds of any video ad are critical for attracting new leads. To bridge the attention gap, it’s important to say what you need to say right at the start, without any buildup or suspense. We’ve broken down the right length for each platform, so you know how to plan your video content. With these guidelines in mind, you can start to nail down the key design and copy concepts that will make your brand win with video.